This shop has been compensated by Collective Bias, Inc. and its advertiser. All opinions are mine alone. 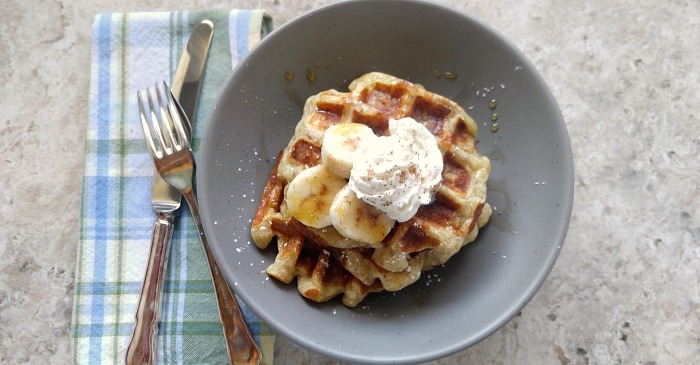 #DelightfulMoments #CollectiveBias It’s time for some banana pumpkin pie spice waffles! September is such a great month. For me, it is the start of the upcoming holiday seasons. I have so much fun this time of the year, moving from one holiday to the next. A staple feature of most of these last few months is the use of pumpkins. These banana pumpkin pie spice waffles have a rich flavor, a hint of pumpkin pie spice, and are the perfect way to enjoy a cool fall morning for breakfast. It’s also one of my 30 minute meals, which makes it even better. 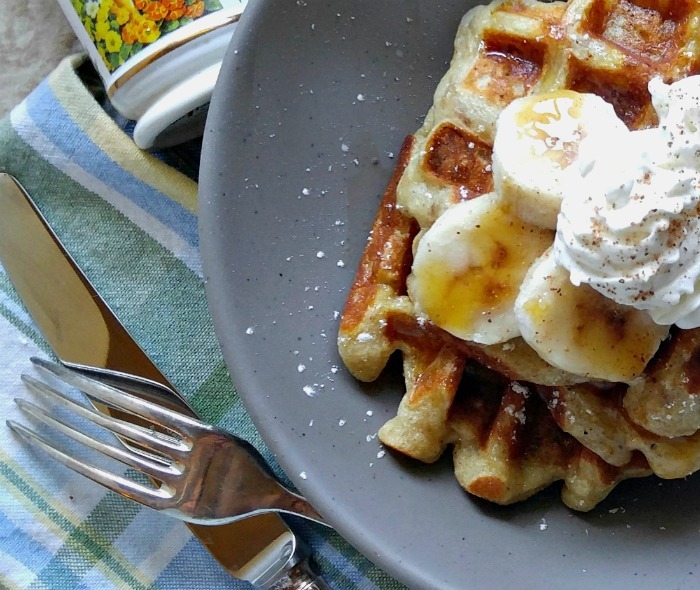 These banana pumpkin pie spice waffles are the perfect start to pumpkin season! I don’t know about you, but I love everything about pumpkin season. I love the change in weather. I love the look of carved pumpkins and the sounds of kids trick or treating in my neighborhood. And most of all, I love the taste of anything pumpkin! 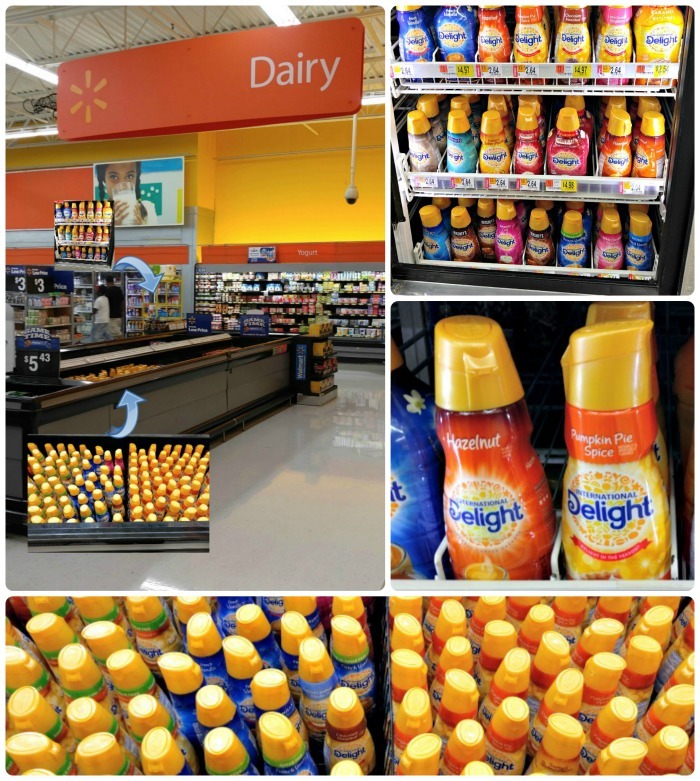 When I was shopping at my local Walmart the other day, I found a huge holiday creamer bunker display featuring International Delight® Pumpkin Pie Spice coffee creamer and other seasonal favorites. My mind went into overdrive thinking about how to make some amazing autumn inspired recipes featuring these creamers. I just knew that a pumpkin pie spice flavored recipe was going to end up on my menu planner this week! And what could be better than including the pumpkin pie spice creamer in a recipe as well as pairing it with a cup of perfectly spiced morning coffee? This will be a match made in pumpkin season heaven, I think. I gathered everything together that I needed for the banana pumpkin pie spice recipe that was coming together in my mind. In addition to the pumpkin pie spice creamer, I also need bananas, egg yolks, and normal waffle ingredients – and of course some pure maple syrup to top these delicious waffles. I knew that I wanted a rich flavor to my waffles, so I started by caramelizing the sliced bananas. This is super easy to do. It just takes a few minutes in a non stick frying pan, butter, sliced bananas and cinnamon. Caramelizing the bananas for a few minutes means that their flavor will be rich and buttery when you add them to the waffle mixture. After they cooked a while, I mashed them a bit with a fork so that they will be easier to incorporate into the dry ingredients. While I made the mixture for the waffles, I heated up my waffle iron. I want it to be nice and hot when I add the mixture so that the waffles will cook quickly. While the waffle iron was warming up, I mixed together the flour, baking powder and pink sea salt in a large bowl. Next, I whisked together the egg yolks, pure vanilla extract, milk and pumpkin pie spice creamer until everything was well combined. 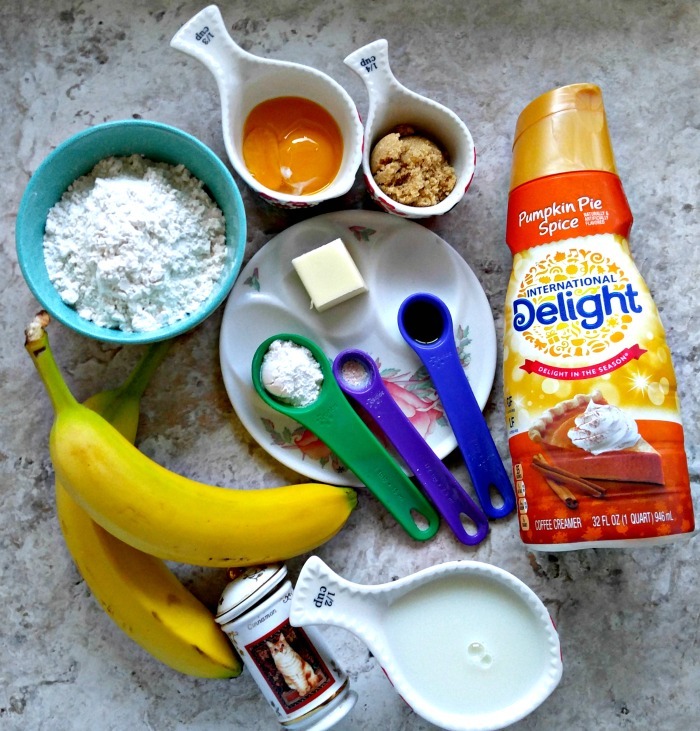 Mix the buttery cinnamon banana mixture into the wet ingredients. They will add a rich taste to the batter and also some lovely texture. The final step is to combine both the wet and dry mixtures together so that you have a thick waffle batter. Pour about 1/4 cup of the mixture into the middle of each waffle well, and cook them about 4-5 minutes until they are golden brown. I use a Belgian waffle maker so that my waffles will end up with deep indentations. I’m sure you can guess why, when you see maple syrup in my list of ingredients. By the way…I don’t worry about making sure the whole well is full. I accept less than perfectly shaped waffles. The reason? 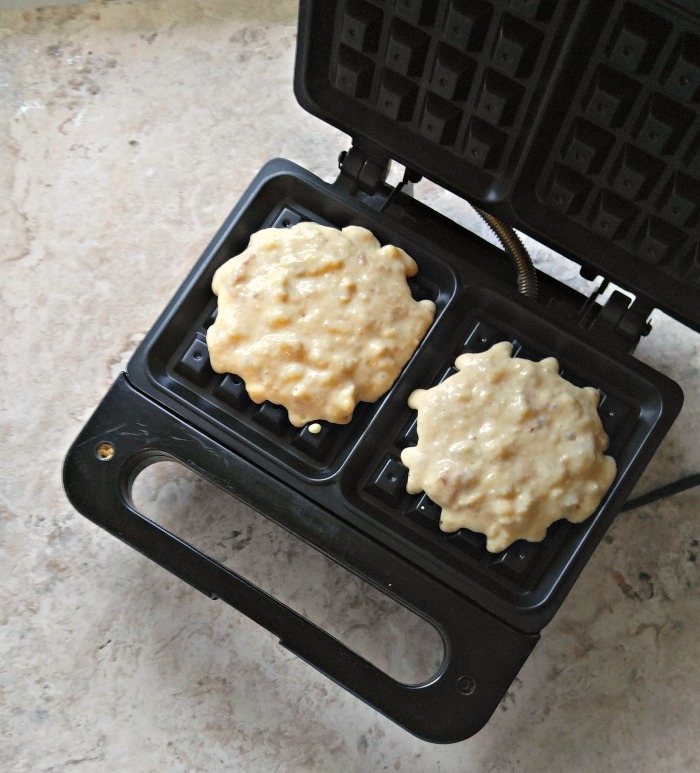 If you have ever tried to clean the outside of an electric waffle iron that has waffle batter spilling out all over it and the counter, you will understand. I’ll happily accept less than perfect shaped waffles for an easier clean up time!! These banana pumpkin pie spice waffles are rich, buttery and have just a hint of the pumpkin pie spice. Just finish them off with a drizzle of pure maple syrup and a sprinkling of nutmeg and you are done. 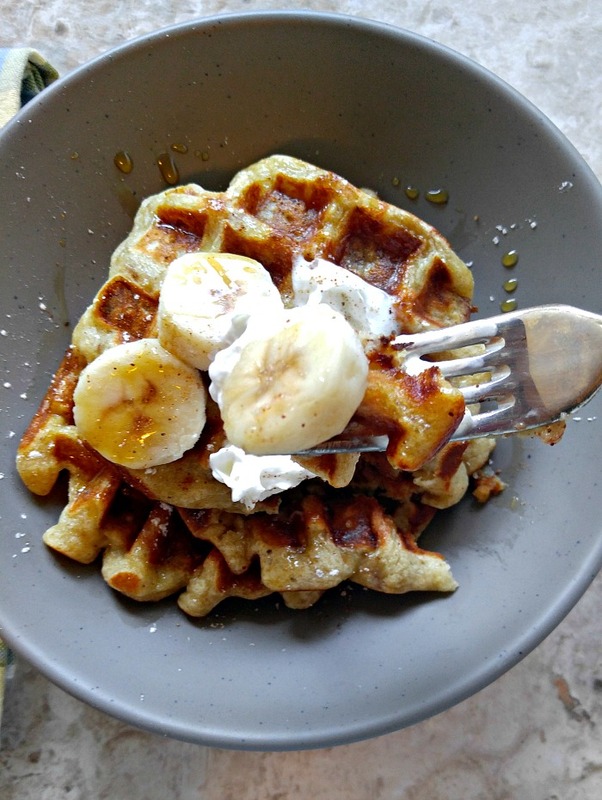 Serve these banana pumpkin pie spice waffles for breakfast or indulge in breakfast for dinner. Either way, just be sure to serve them during pumpkin season. They are THAT good!! As in really, really, REALLY caramelized rich banana pumpkin pie spice good. And don’t forget to add your favorite cup of Joe flavored with some of the pumpkin pie spice creamer, too. The coffee and waffles make THE perfect breakfast! 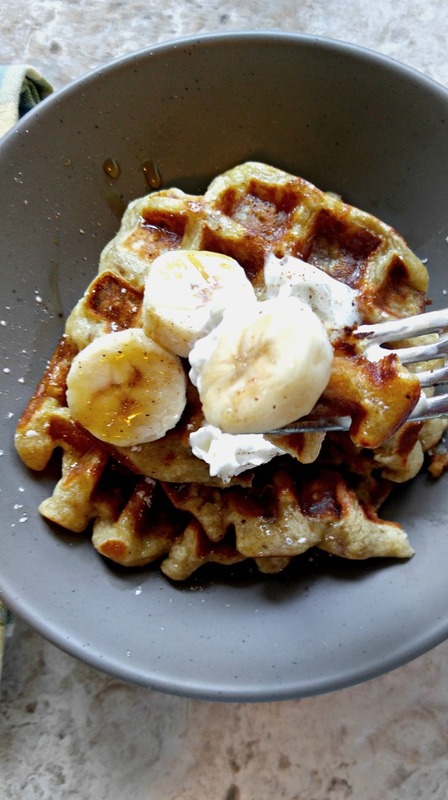 Would you like to make these delicious banana pumpkin pie spice waffles for your crowd? Head on over to your local Walmart and look for their big bunker display. My store had the product in one of the bunkers as well as in an upright freezer. They had dozens of flavors too. I grabbed a bottle of the new International Delight® Chocolate Hazelnut coffee creamer, too. Bet you can guess what breakfast will be next week. Here’s a hint. It has something to do with pancakes…and chocolate…and hazelnuts…YUM! Is it still warm where you are? Try making an International Delight® Pumpkin Pie Spice Frappé. This YouTube video shows how easy the recipe is. And be sure to check out the social hub for more ideas on how to use International Delight® pumpkin pie spice coffee creamer. 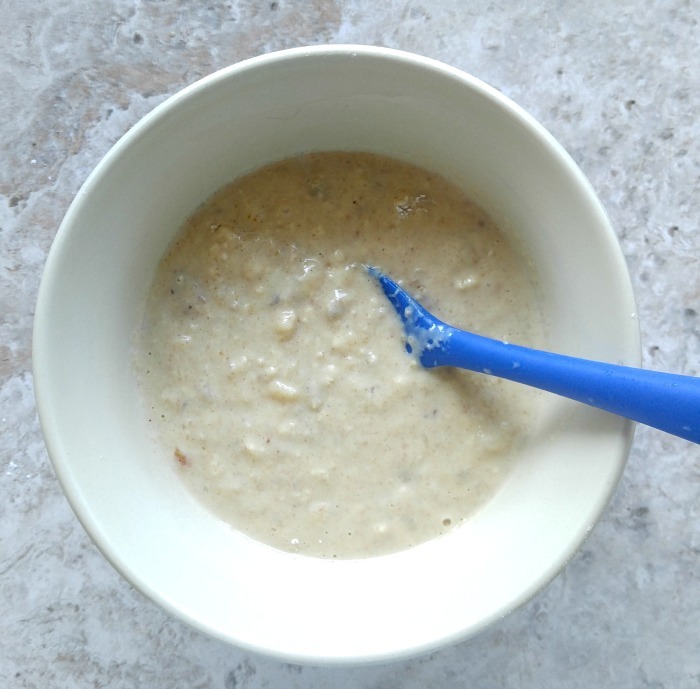 For more tasty breakfast recipes, be sure to visit my Pinterest Breakfast board. sliced bananas, maple syrup and nutmeg. Slice the bananas into rounds and set aside. 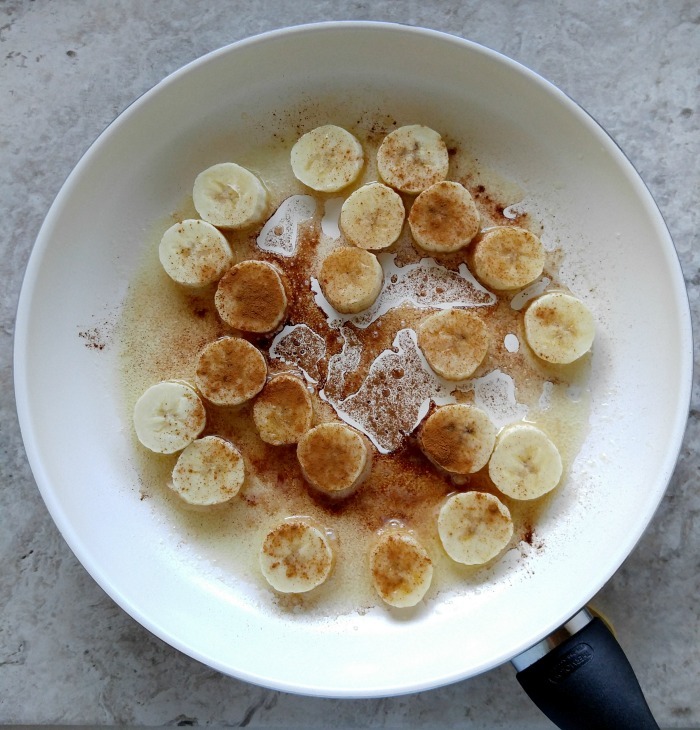 Heat the butter in a non stick frying pan and add the sliced bananas and cinnamon. Cook over a medium low heat until the bananas are lightly caramelized. Remove from the heat and mash with a fork. Preheat the waffle iron. 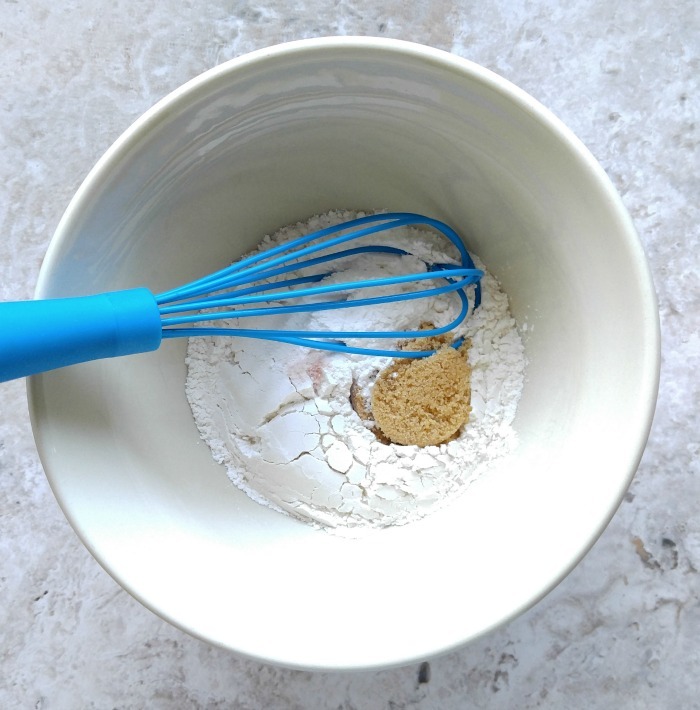 While it is heating, mix together the flour, brown sugar, baking powder, and sea salt in a bowl. 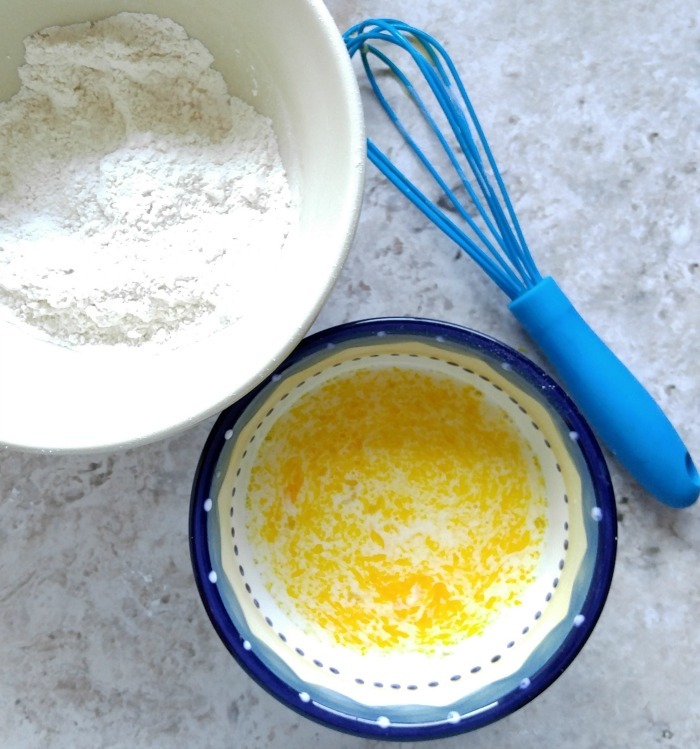 Whisk together the egg yolks with the milk, vanilla extract, and Pumpkin pie spice coffee creamer. 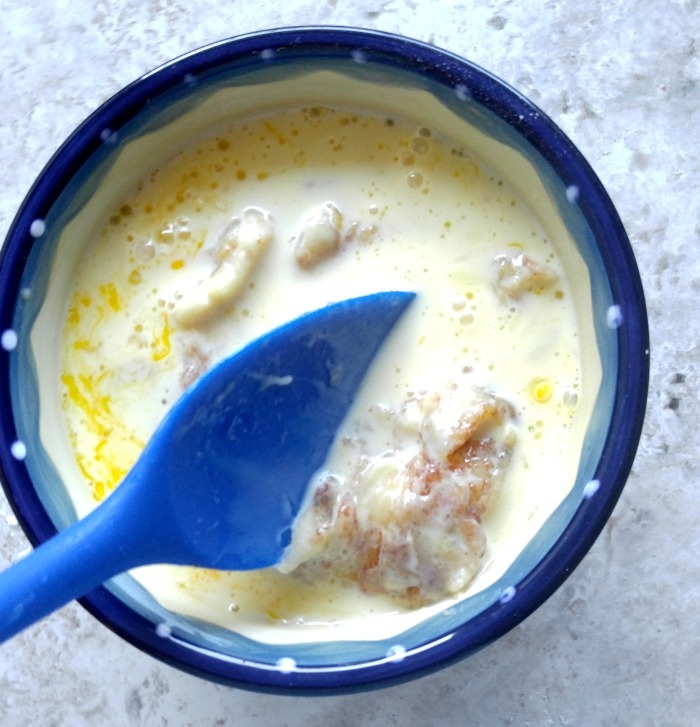 Stir in the banana butter mixture. Then combine the wet and the dry ingredients together to make a nice thick waffle batter. How is this whole30? 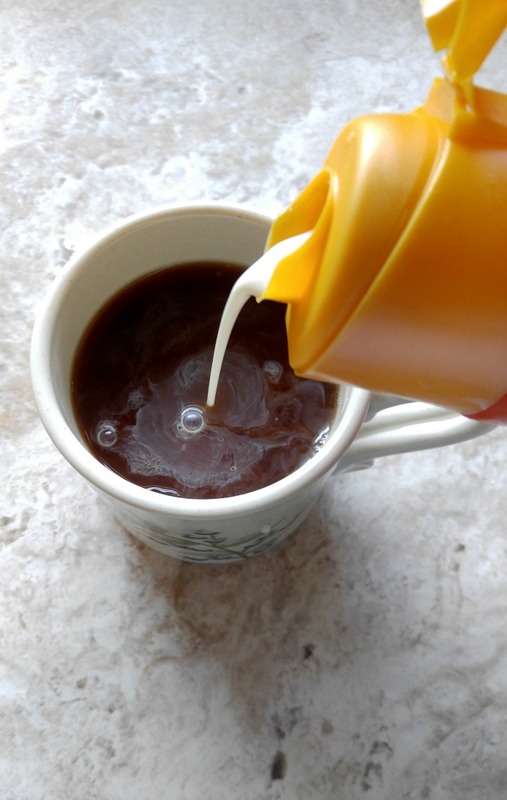 The creamer has sugar….